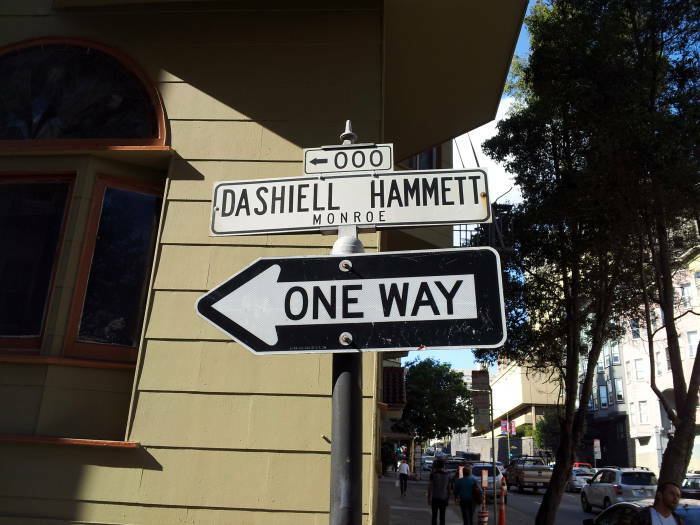 Dashiell Hammett was one of America's premier authors of noir fiction, writing several novels and short stories featuring tough detectives in morally ambiguous situations. His two prominent characters, Sam Spade of The Maltese Falcon and the nameless Continental Op of novels Red Harvest and The Dain Curse plus a number of short stories, were based on Hammett's personal experiences as an operative for the Pinkerton National Detective Agency. 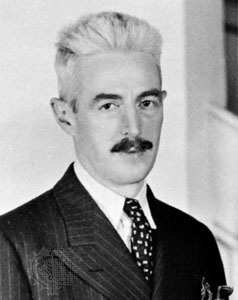 Samuel Dashiell Hammett was born in rural southern Maryland in 1894. His middle name came from his mother's family name. They had lived in Maryland for several generations, Anglicizing their family name from the French De Chiel to Dashiell. When he turned to writing, he published under his middle name which was pronounced da-SHEEL and not DASH-ull. Sam left Baltimore's Polytechnic High when he was just fourteen to work to help support his family. He was a messenger for the Baltimore and Ohio Railroad before taking a job with the Pinkerton National Detective Agency in 1915. Hammett was a Pinkerton operative from 1915 until February 1922, with time out in the middle to serve in World War I and to recover from the Spanish Flu and tuberculosis. He started out as a clerk at Pinkerton, but he was smart and good at his job and soon was promoted to detective. He was trained by James Wright, a small and sturdy man who was the basis for the Continental Op. [It was then,] perhaps at the moment he was asked to murder Frank Little, or perhaps at the moment he learned that Little had been killed, possibly by other Pinkerton men, Hammett saw that the actions of the guards and the guarded, of the detective and the man he's stalking, are reflexes of the same sensibility, on the fringe where murderers and thieves live. He saw that he himself was on the fringe or might be, in his present line of work, and was expected to be, according to a kind of oath of fealty that he and other Pinkerton men took." He also learned something of the lives of poor miners, whose wretched strikes the Pinkerton people were hired to prevent, and about the lies of mine owners. Those things were to sit in the back of his mind. Hammett enlisted in the U.S. Army in 1918 and served in the Motor Ambulance Corps. He soon fell ill in the 1918 flu pandemic, an unusually deadly pandemic caused by the H1N1 influenza virus. It infected 500 million people around the world, killing between 50 and 100 million people, 3% to 6% of the world's population. By comparison, the horrific World War killed over 9 million combatants and 7 million civilians, just one-sixth to one-third of the number killed in the influenza pandemic. The massive troop movements and concentrations of the World War increased transmission and mutation rates. It was first observed in the U.S. in Kansas in January, 1918. On 4 March 1918 a cook at Fort Riley in Kansas fell ill. By mid-day on the 11th, over 100 soldiers were in the base hospital and the disease had reached New York. A more virulent strain appeared in August 1918, appearing simultaneously in Boston in the U.S., in Brest in France, and in Sierra Leone in West Africa. Major waves of infection and death continued through much of 1919. Hammett was infected with the influenza and then, weakened by the flu, contracted tuberculosis. After discharge from the Army he went back to work for Pinkerton, transferring to their Spokane, Washington office. His tuberculosis worsened and he went into a Public Health Service hospital in Tacoma from November 1920 to February 1921. He met and fell in love with Josephine "Jose" Dolan, a nurse in the Tacoma hospital. Hammett was transferred from the cold and foggy Pacific Northwest down the coast to sunny and warm San Diego, to a "lunger" hospital specializing in respiratory cases. Hammett moved north to San Francisco in 1921 and returned to work for Pinkerton's. 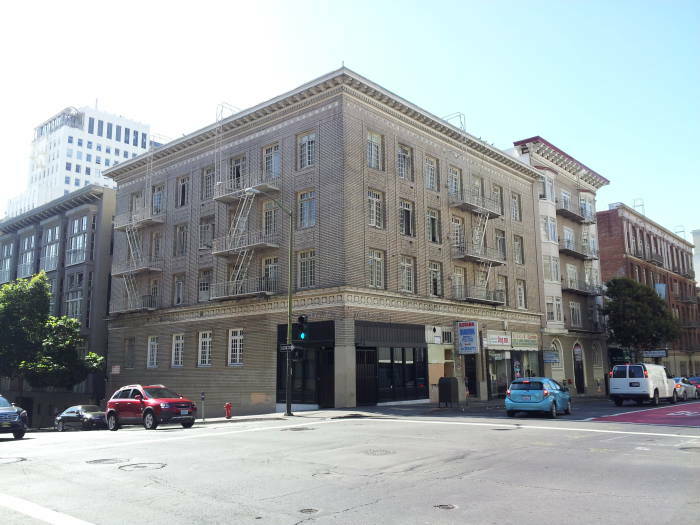 Their office was in Room 314 of the James Flood Building at 870 Market Street. 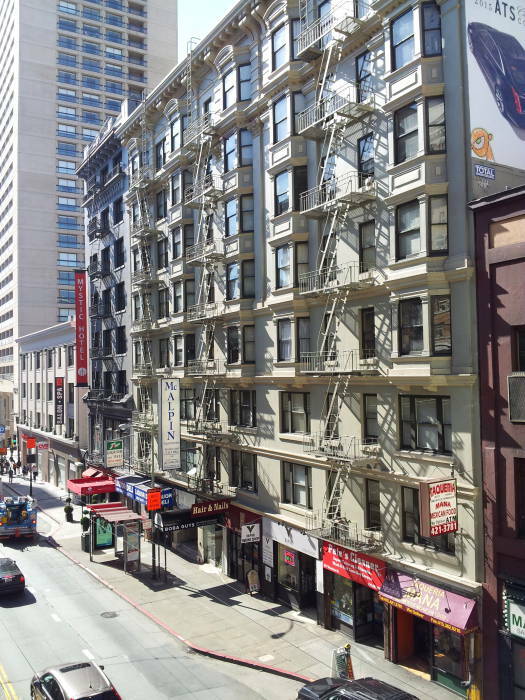 The 12-story highrise, completed in 1904, was one of the few structures to survive the 1906 San Francisco earthquake and following fires. "The Maltese Falcon". One of several copies made from the original used in the filming of the classic Humphrey Bogart film. 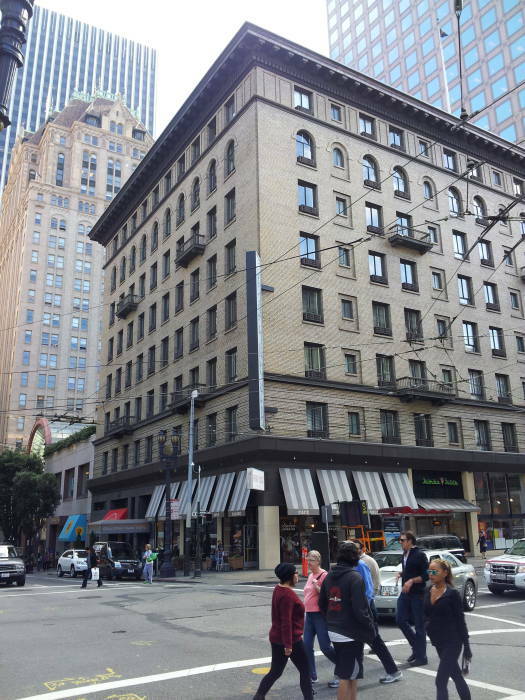 Purchased by John Konstin, owner of John's Grill — a regular hang-out for author Dashiell Hammett who wrote "The Maltese Falcon" during his tenure as an employee of Pinkerton's Detective Agency located in the Flood Building. 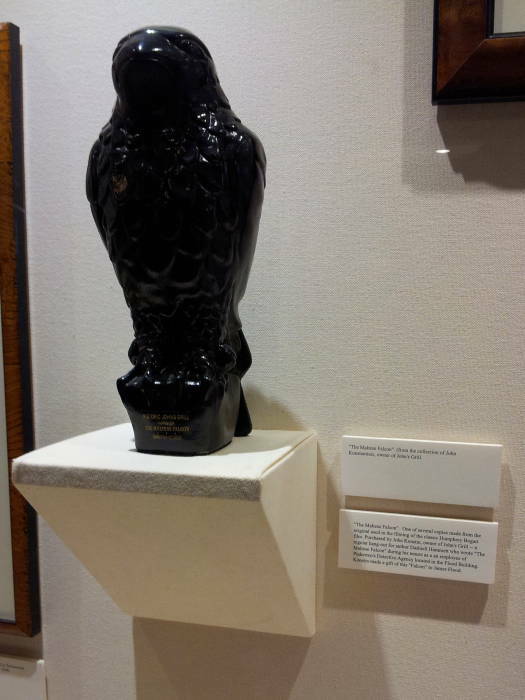 Konstin made a give of this "Falcon" to James Flood. 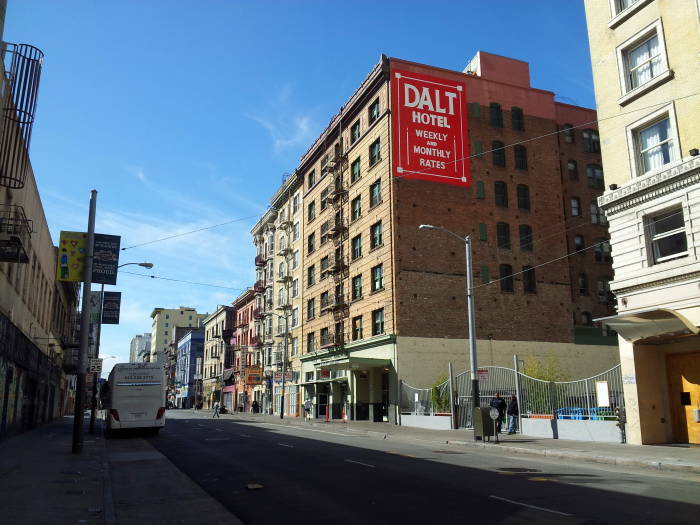 Hammett initially lived in a rented room at 120 Ellis Street, seen in the first picture below. 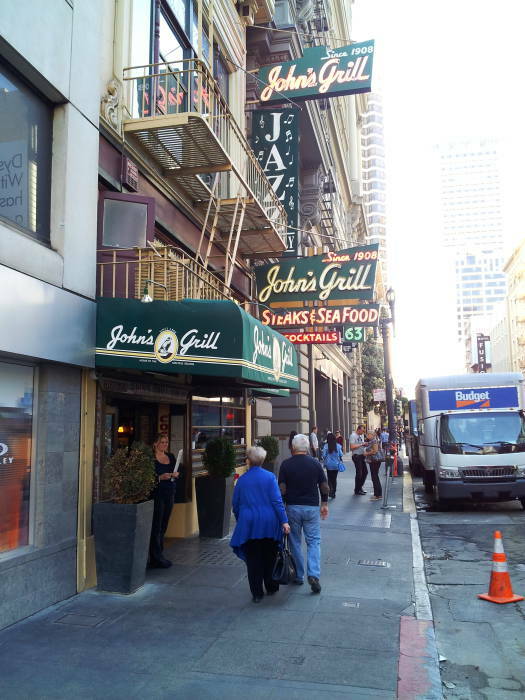 John's Grill was just down and across Ellis Street at #63, we will see a picture of it further below. Jose wrote Hammett to tell him she was pregnant with his child. They met in San Francisco to marry. 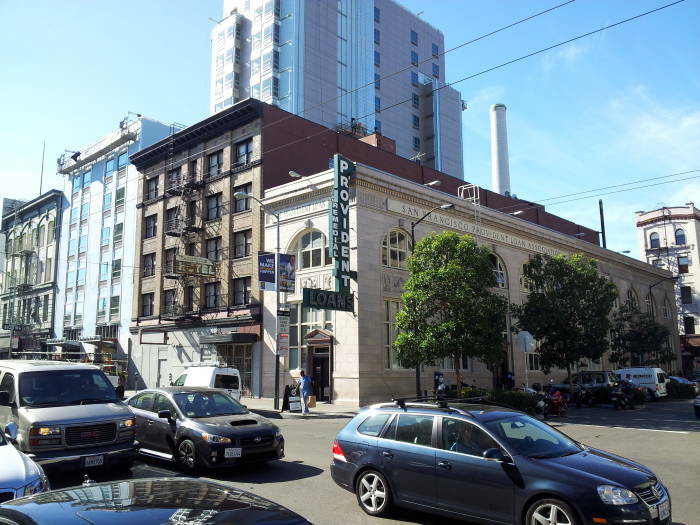 Pregnant or not, it wouldn't do for them to live together before marriage, so Sam got her a room at the Golden West Hotel at 114 Powell Street, the black and white building in the last picture above. 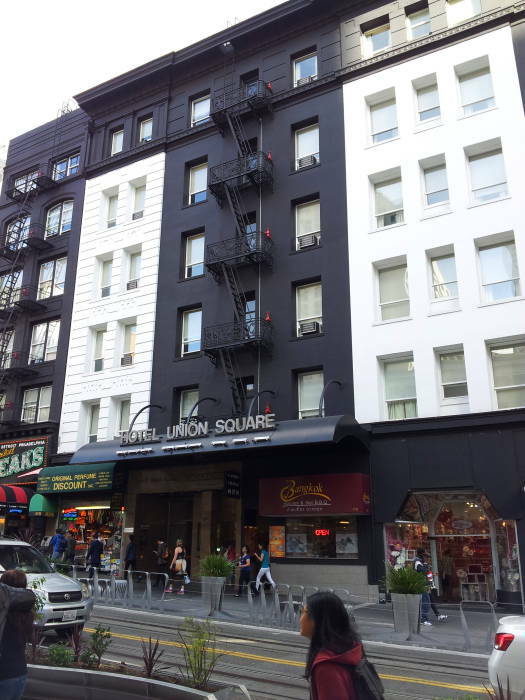 It has since been renamed the Hotel Union Square. The Hammetts moved to the Crawford Apartments at 620 Eddy Street, just west of Larkin. Their small apartment is said to have been above a bootlegging operation. At the time of their marriage in July 1921, Prohibition had been in effect for a year and a half and bootlegging was common. 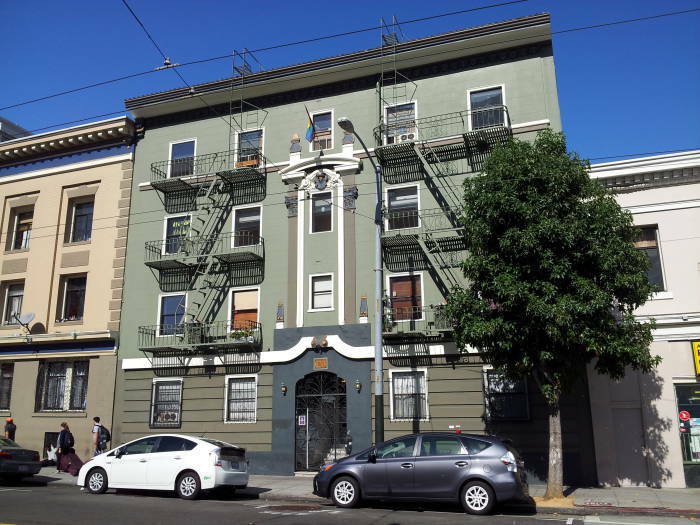 Their Eddy Street apartment building is in Little Saigon now, just around the corner from a number of Vietnamese businesses. 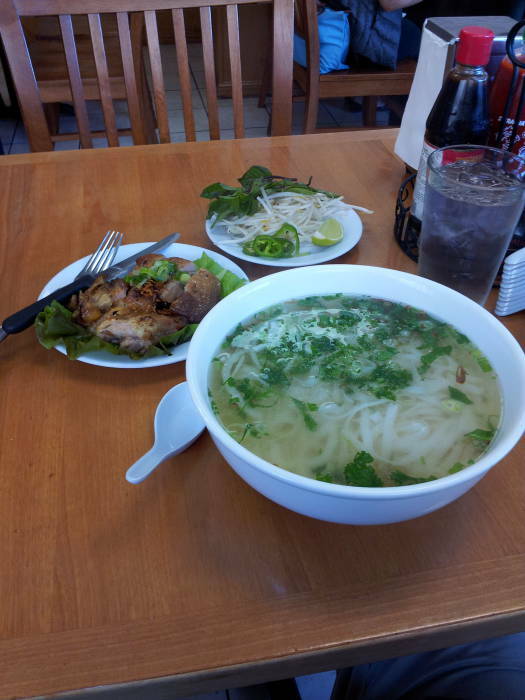 The Golden Lotus has good phở, maybe you will stop for a large bowl. 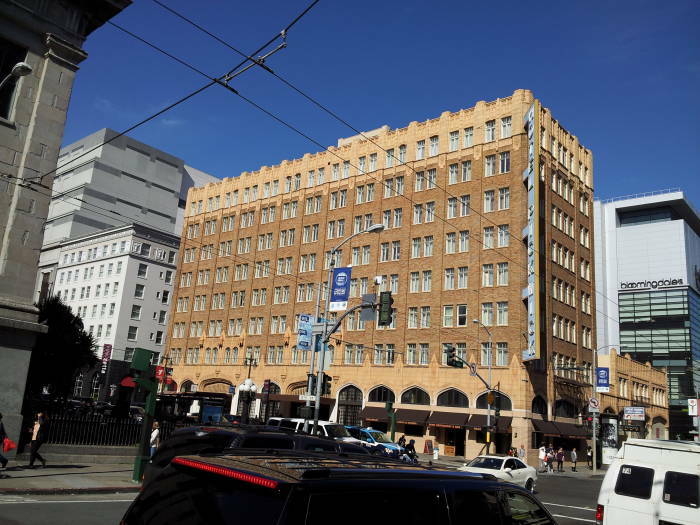 The area known as the Tenderloin, a roughly triangular area of about 50 square blocks bounded roughly by Geary Street on the north, Mason Street on the east, Market Street on the south, and Van Ness Avenue on the west, was notorious in the 1920s for its speakeasies, gambling and billiard halls, plus the theaters, restaurants, and other nightlife. It has maintained a seedy atmosphere up to today. 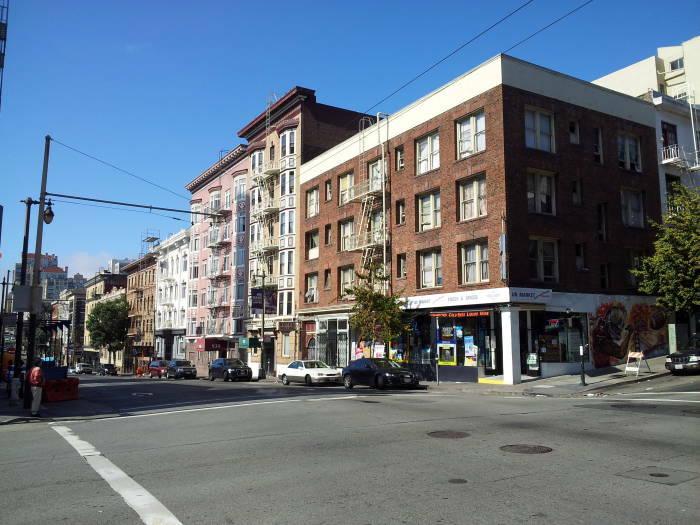 The easternmost block of Turk Street was, for several years, the block with San Francisco's highest annual crime rate. The city recently prohibited parking along the easternmost few blocks of Turk, and that has greatly decreased the crime rate. Hammett continued working for Pinkerton's until February 1922. With his weakened lungs he could no longer spend the night tailing someone through the cold fog. He found a job writing advertising copy for Samuel's Jewelry on Market Street, near the Flood Building housing the Pinkerton Agency. The building at the corner of Fifth Street and Market Street housed over forty jewelers and the whole first floor was a jewelry showroom. Hammett wrote advertising copy, and had lunch with the owner Albert Samuel at John's Grill nearby on Ellis Street. Hammett had an affair with Peggy O'Toole, a typist at Samuel's who became the model for the character of Brigid O'Shaughnessy in The Maltese Falcon. 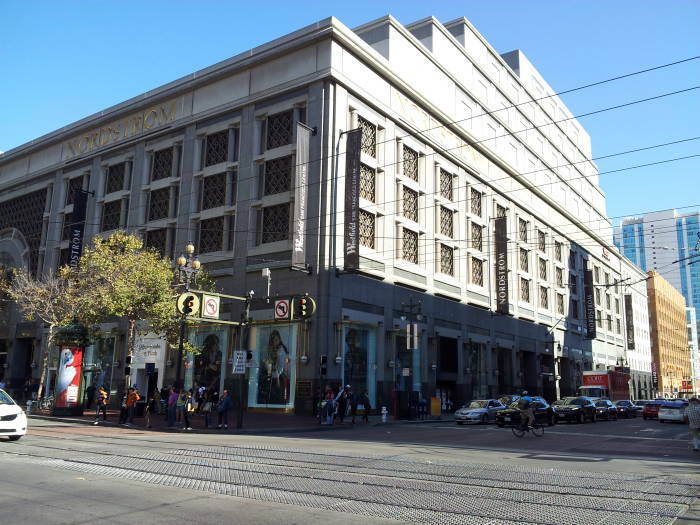 The building at Fifth and Market now houses a Nordstrom's department store. Hammett began writing fiction. His first published work of fiction appeared in The Smart Set, an upscale society magazine, in 1922. His style of gritty detective stories was much better suited to the pulp crime magazines. In 1923 Black Mask, one of the most popular pulp detective and crime magazine, published his story "Arson Plus". He continued to publish in Black Mask through the 1920s, introducing a nameless investigative operator called "the Continental Op", working for the Continental Detective Agency, fictional but clearly based on the Pinkerton Agency and the Op himself based on the small and sturdy James Wright who had trained Hammett as a sleuth. Hammett's tuberculosis flared up again in 1926, the year his daughter Jo was born. He was advised to live separately from his family, to avoid infecting his wife and children with TB. He and Jose had been drifting apart, and the new arrangement better suited his writing and affairs. 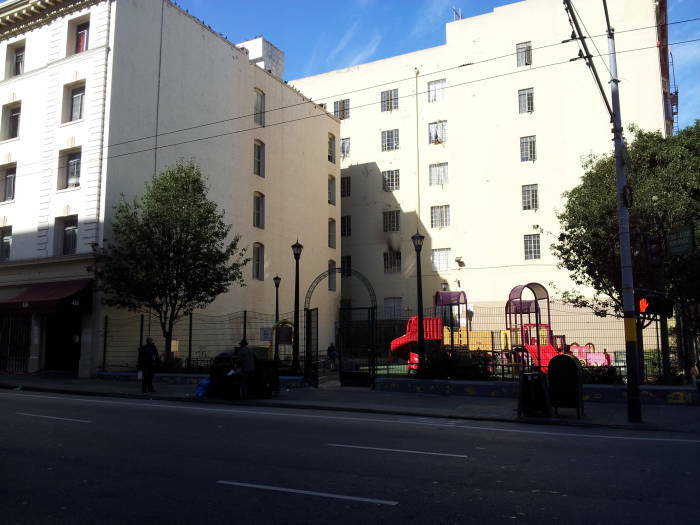 He moved to an apartment at 408 Turk Street, a vacant corner lot today. Jose and the children lived north across the Bay in Fairfax, near Marin, where Hammett took the ferry to visit them every Sunday. He never lived with them again, and the Hammetts made it official with a divorce in 1937, but he supported them until his money ran out in the 1950s. In 1927 he finished a full-length novel featuring the Continental Op. It was serialized as "Poisonville" in 1927–1928 in Black Mask, and then published as a novel under the title Red Harvest in 1929. The story was inspired by the 1920 Anaconda Road Massacre in Butte, Montana, three years after Hammett's experiences there with Pinkerton. When Sergio Leone's movie A Fistful of Dollars was released in 1964, someone supposedly told Akira Kurosawa that Leone had stolen Kurosawa's story from his 1961 movie Yojimbo, to which Kurosawa replied that he had taken the idea for his movie from Hammett's novel Red Harvest. Hammett published his novel The Dain Curse in 1929. He dedicated it to Albert Samuel, his friend and former employer. He then published The Maltese Falcon in February, 1930. Hammett said, "All my characters were based on people I've known personally, or known about." The characters of The Maltese Falcon were based on people Hammett knew, with some aspects of its reluctant hero, Sam Spade, based on the author. 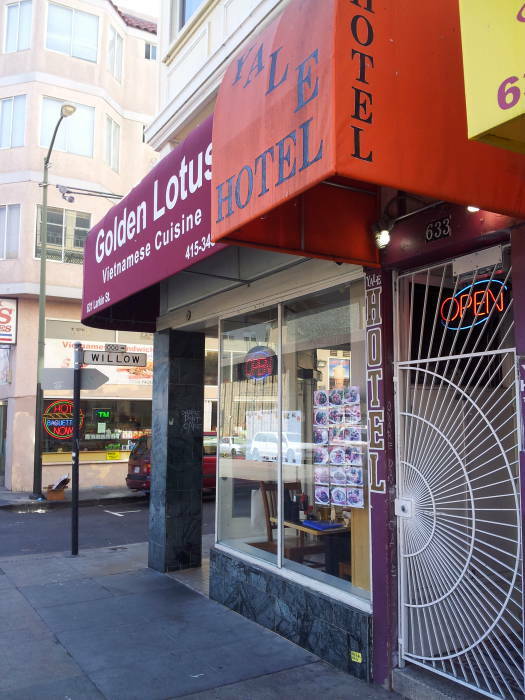 Most of the locations were based in detail on actual locations around the Tenderloin area plus a few blocks outside, a few of them under modified names. Hammett's background as an investigator comes through. Meals not necessarily critical to the story are described as if for an investigator's expense report, and people are described in a way that a partner investigator could take over a tail operation or pick up a suspect in a crowded public scene. 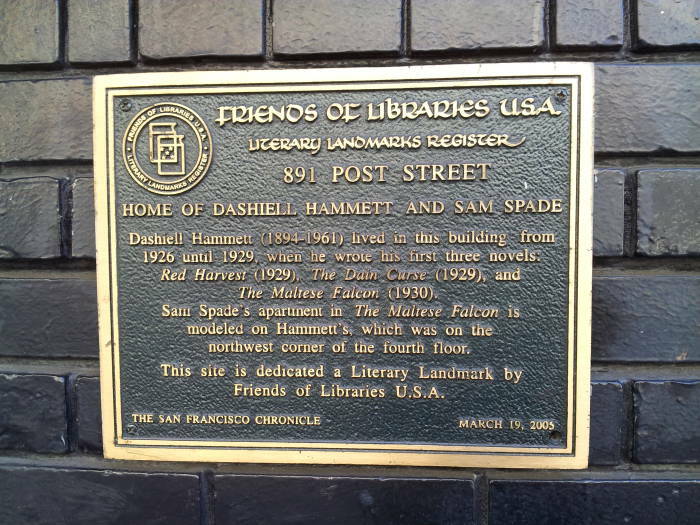 Hammett's fiction commemorated San Francisco, and San Francisco commemorated him. Lawrence Ferlinghetti, beat poet and founder of the City Lights Bookstore, petitioned the city in 1988 to rename twelve small streets in honor of local writers and artists. 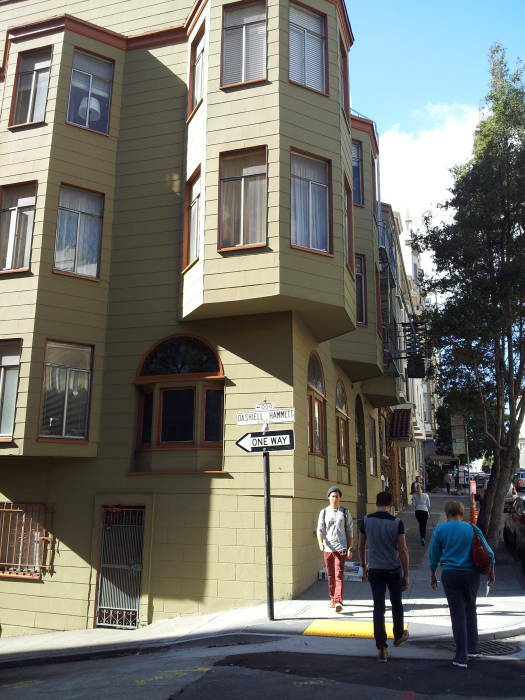 This short, steep, narrow street runs for one block from Pine Street to Bush Street between Powell Street and Stockton Street. In The Maltese Falcon Sam Spade buys two sacks of Bull Durham tobacco at Otto's Corner Store at the corner of Kearny and Sutter. 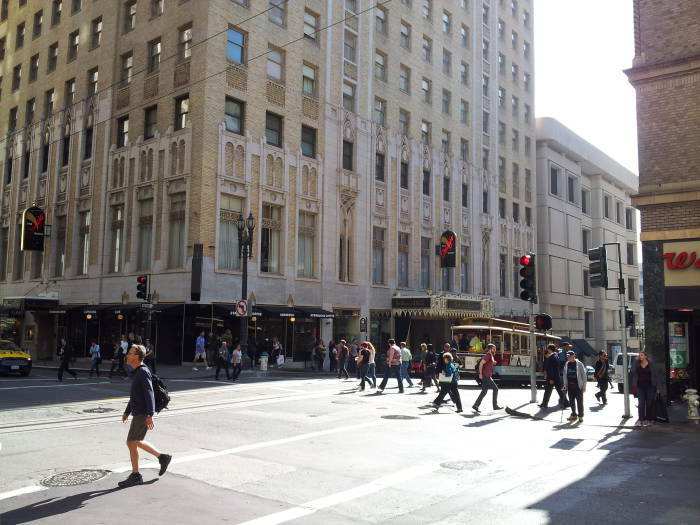 The Hotel Sutter is on the southeast corner of that intersection today. 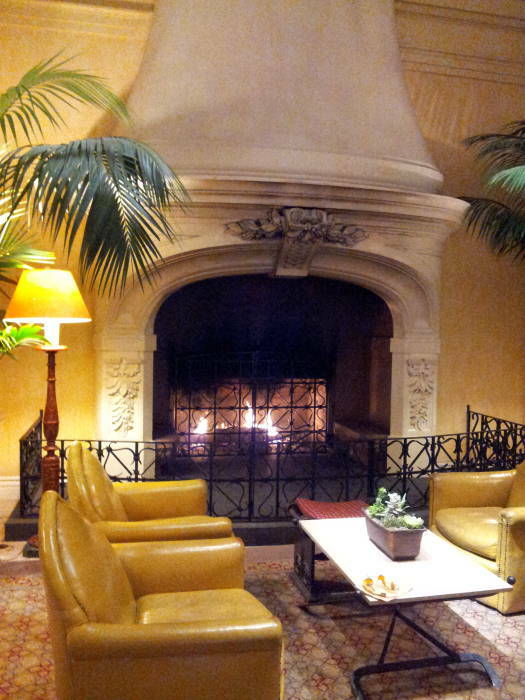 After a major renovation in 2007 the Hotel Sutter was rebranded as the Galleria Park Hotel. 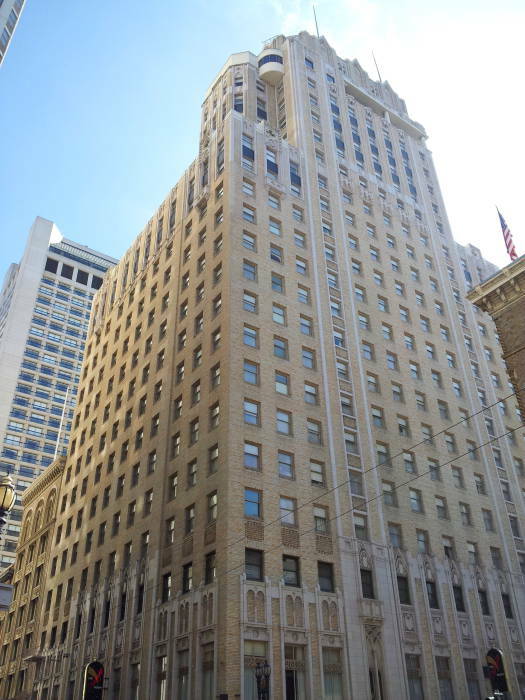 The Spade and Archer detective agency was located on the fifth floor of the Hunter-Dulin Building at 111 Sutter Street. 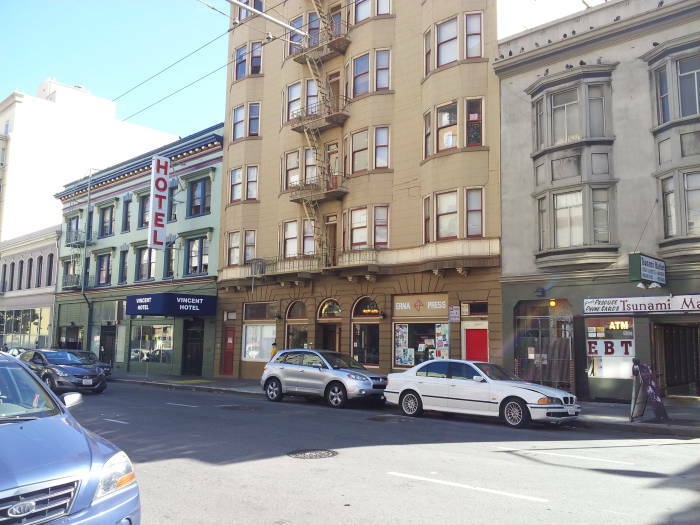 That's at the east end of the same block, visible beyond the Hotel Sutter here. The 25-story 94-meter-tall office building was completed in 1926. It's a French Renaissance Revival structure with sand-colored Granitex on its primary façades and brick elsewhere, decorated with medallions showing wistful young women bearing garlands and a cornice with squat eagles and oxen. Its Neo-Norman arched entrance leads to a pseudo-Medieval lobby. 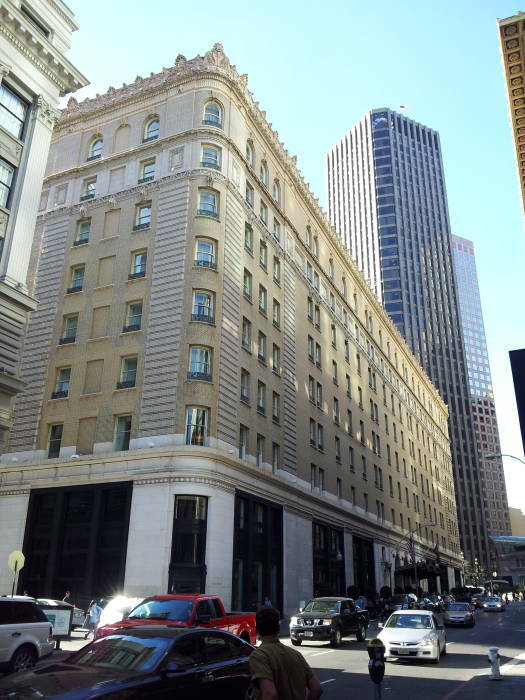 It was the West Coast headquarters of the National Broadcasting Company from 1927 to 1942, with the executive offices on the 21st floor and the studio offices on the 22nd floor. 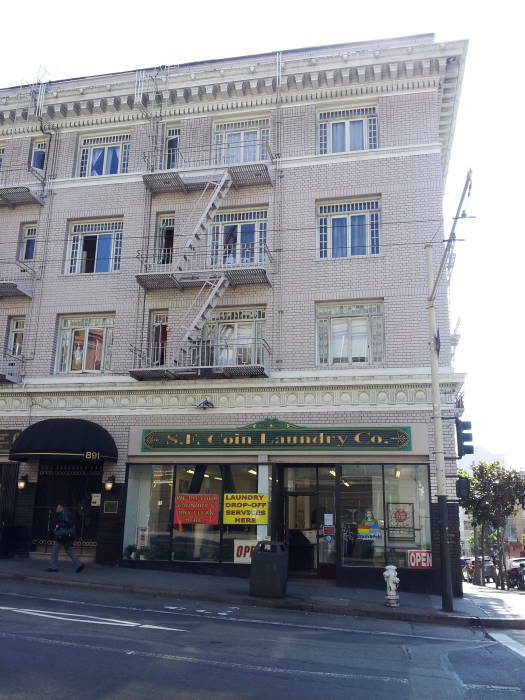 Spade walked up Sutter Street to Kearny, where he entered a cigar store to buy two sacks of Bull Durham. When he came out the youth was one of four people waiting for a street car on the opposite corner. 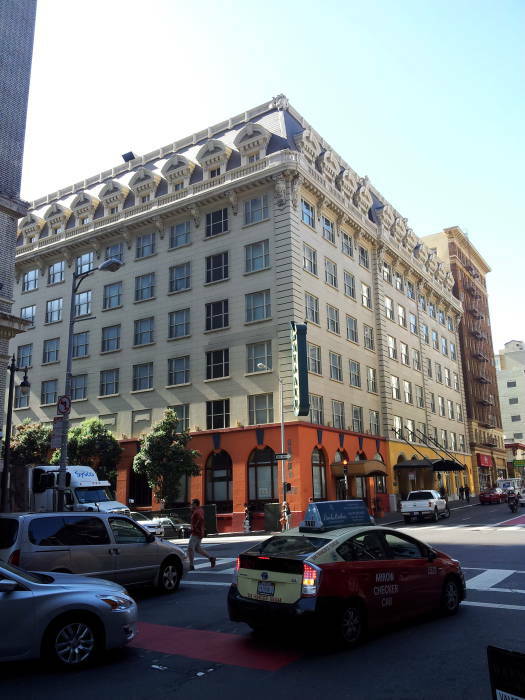 Spade went into the Hotel Sutter and telephoned the Alexandria. Gutman was not in. No member of Gutman's party was in. Spade telephoned the Belvedere. Cairo was not in, had not been in that day. Spade went to his office. 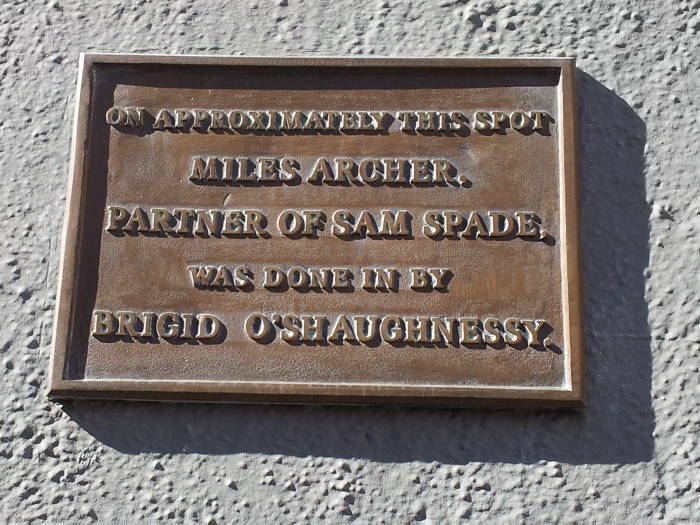 Miles Archer took the assignment, interested in their new client Brigid O'Shaughnessy. She killed him in the dead-end alley of Burritt Street, which leads off for one block to the south of Bush Street just west of Stockton. The city has marked the location with a matter-of-fact plaque. 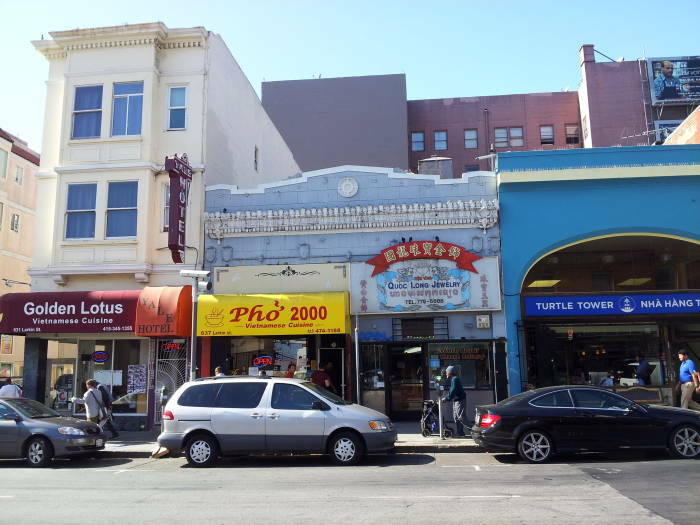 Where Bush Street roofed Stockton before slipping downhill to Chinatown, Spade paid his fare and left the taxicab. San Francisco's night-fog, thin, clammy, and penetrant, blurred the street. A few yards from where Spade had dismissed the taxicab a small group of men stood looking up an alley. Two women stood with a man on the other side of Bush Street, looking at the alley. There were faces at windows. 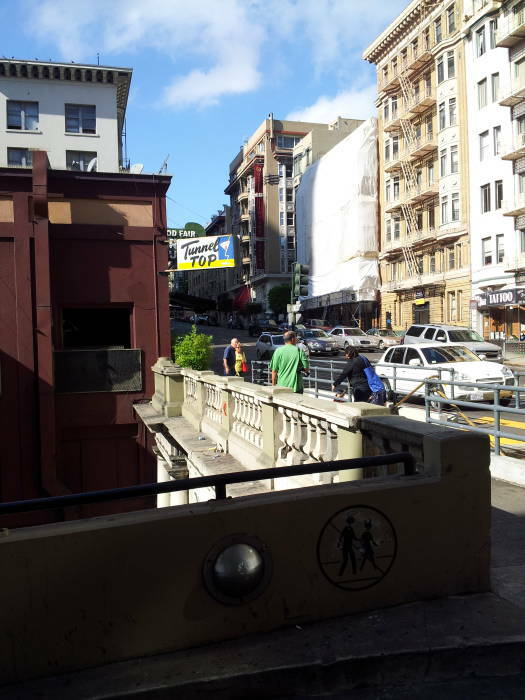 Spade crossed the sidewalk between iron-railed hatchways that opened above bare ugly stairs, went to the parapet, and resting his hands on the damp coping, looked down into Stockton Street. An automobile popped out of the tunnel beneath him with a roaring swish, as if it had been blown out, and ran away. Not far from the tunnel's mouth a man was hunkered on his heels before a billboard that held advertisements of a moving picture and a gasoline across the front of a gap between two store-buildings. The hunkered man's head was bent almost to the sidewalk so he could look under the billboard. A hand flat on the paving, a hand clenched on the billboard's green frame, held him in this grotesque position. Two other men stood awkwardly together at one end of the billboard, peeping through the few inches of space between it and the building at that end. The building at the other end had a blank grey sidewall that looked down on the lot behind the billboard. Lights flickered on the sidewall, and the shadows of men moving among lights. Spade turned from the parapet and walked up Bush Street to the alley where men were grouped. A uniformed policeman chewing gum under an enameled sign that said Burritt St. in white against dark blue put out an arm and asked: "What do you want here?" "I'm Sam Spade. Tom Polhaus phoned me." 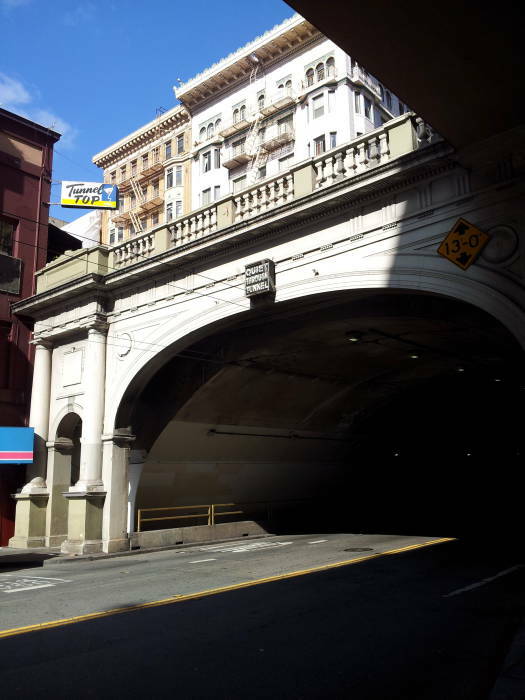 The Stockton Tunnel was the first tunnel in San Francisco, opened in 1914 after $450,000 in construction costs. It connected North Beach, which had been a relatively quiet area with a small-town atmosphere, to the busy downtown. Dundy jumped up and tapped Spade's chest with the ends of two bent fingers. 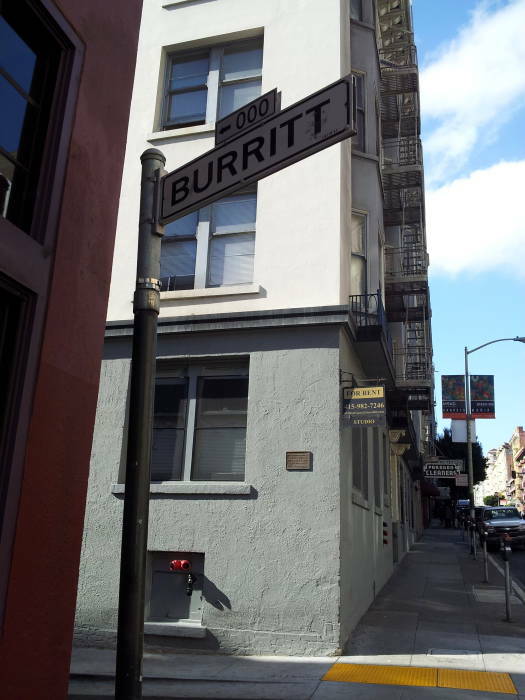 "Just this," he said, taking pains to make each word distinct, emphasizing them with his tapping finger-ends: "Thursby was shot down in front of his hotel just thirty-five minutes after you left Burritt Street." Lieutenant Dundy raised his two bent fingers toward Spade's chest, quickly lowered them, and said: "I give you ten minutes to get to a phone and do your talking to the girl. I give you ten minutes to get to Thursby's joint—Geary near Leavenworth—you could do it easy in that time, or fifteen at the most. And that gives you ten or fifteen minutes of waiting before he showed up." 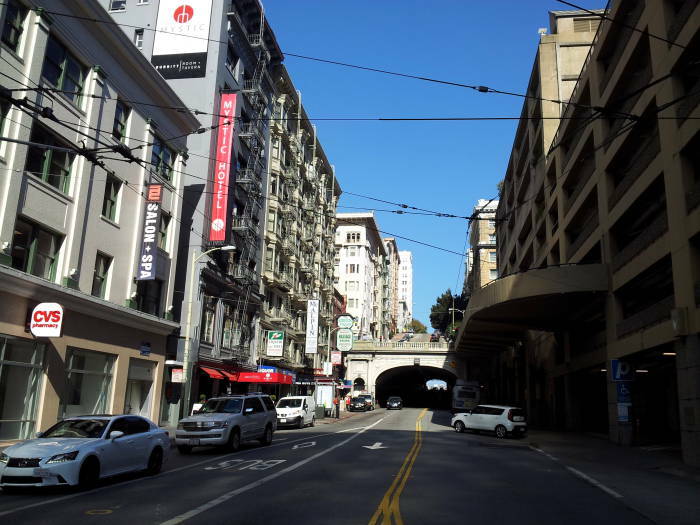 Geary Boulevard, Geary Street east of Van Ness, is a major easy-west thoroughfare running seven miles through San Francisco. It runs east from Market Street downtown toward the west, terminating on the coast road overlooking the Pacific Ocean. At this point in the story Spade doesn't know that "Miss Wonderly" is really Brigid O'Shaughnessy. He goes to her hotel, the St. Mark's. Spade went through the St. Mark's long purplish lobby to the desk and asked a red-haired dandy whether Miss Wonderly was in. The red-haired dandy turned away, and then back shaking his head. "She checked out this morning, Mr Spade." Spade walked past the desk to an alcove off the lobby where a plump young-middle-aged man in dark clothes sat at a flat-topped mahogany desk. 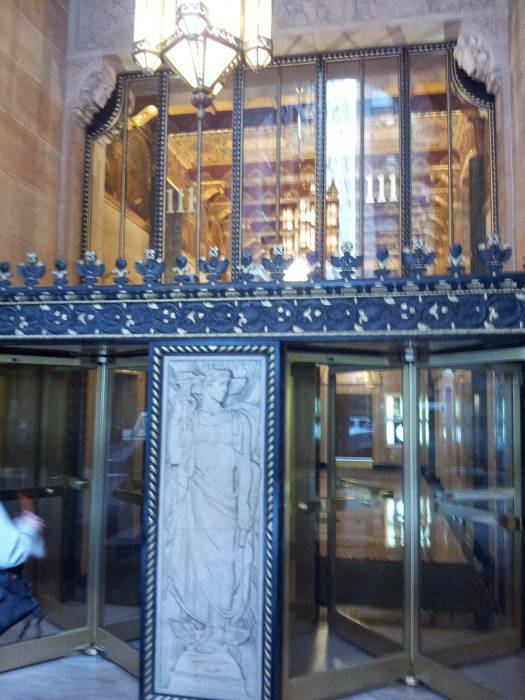 On the edge of the desk facing the lobby was a triangular prism of mahogany and brass inscribed Mr. Freed. 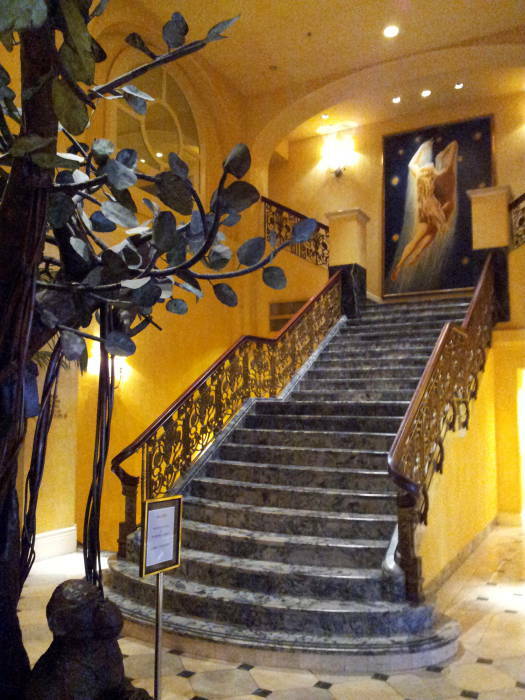 The Saint Mark's Hotel is really the Saint Francis Hotel. Its two twelve-story south wings were completed in 1904, and the double-width north wing initially designed as apartments for permanent residents was added in 1913. A 32-story tower was added on the rear in 1972, making it one of the largest hotels in the city with over 1,200 rooms. 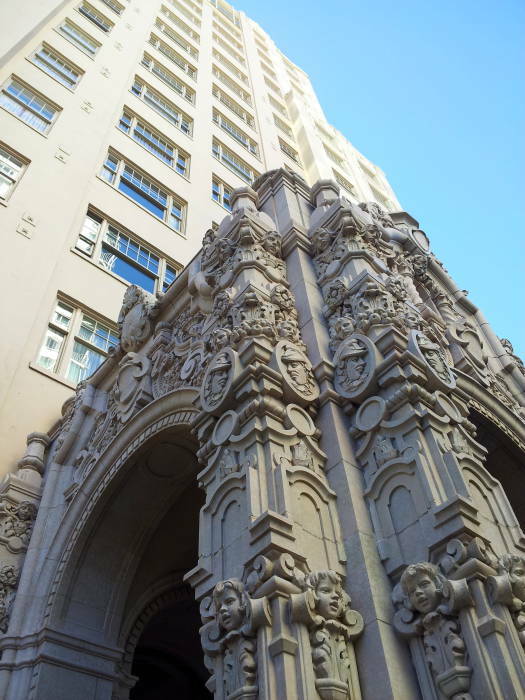 The 1904 completion of the main core meant that it was open by the time of the 1906 earthquake. The earthquake lasted for 55 seconds and has been estimated as magnitude 7.8. 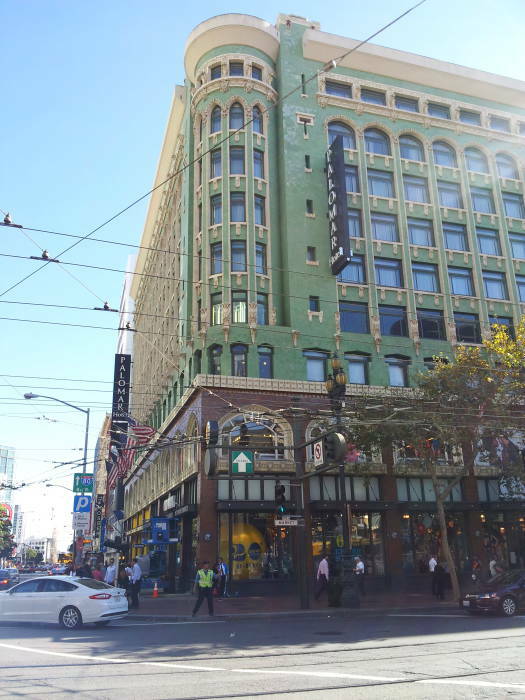 It destroyed over 80% of the city and killed about 3,000 people, but the Saint Francis Hotel made it through with heavy cosmetic damage but no structural damage. 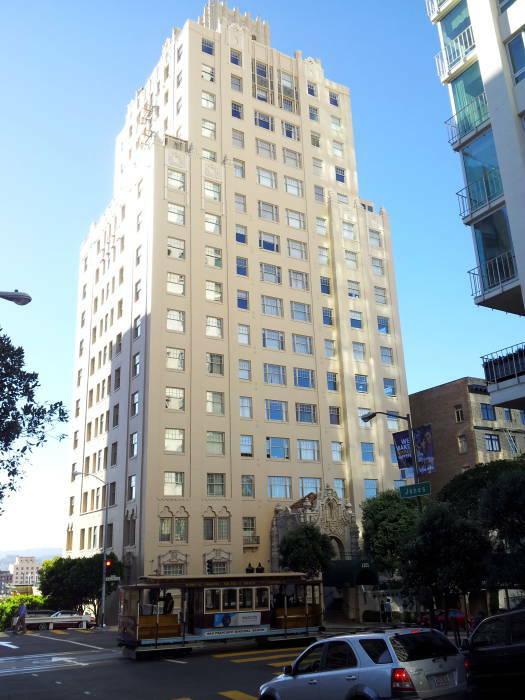 In the 1920s, when the novel was set and during the time Hammett was writing it, the hotel was the place where major political figures and Hollywood stars stayed. "And Miss Wonderly called up." "It's about time. What did she say?" "She wants to see you." The girl picked up a slip of paper from her desk and read the memorandum penciled on it. 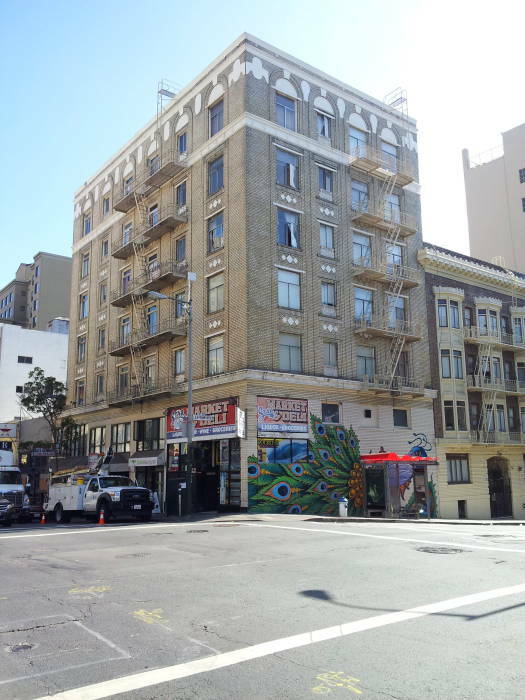 "She's at the Coronet, on California Street, apartment one thousand and one. You're to ask for Miss Leblanc." Spade made the growling animal noise in his throat again and sat down on the settee. "How much money have you got?" he asked. The question startled her. Then she pinched her lower lip between her teeth and answered reluctantly: "I've about five hundred dollars left." She hesitated, looking timidly at him. He made angry gestures with mouth, eyebrows, hands, and shoulders. She went into her bedroom, returning almost immediately with a sheaf of paper money in one hand. He took the money from her, counted it, and said: "There's only four hundred here." "I had to keep some to live on," she explained meekly, putting a hand to her breast. "Can't you get any more?" "You must have something you can raise money on," he insisted. "I've some rings, a little jewelry." "You'll have to hock them," he said, and held out his hand. "The Remdial's the best place—Mission and Fifth." Spade ate dinner at Herbert's Grill in Powell Street. When he left the Grill, at a quarter to eight, the youth was looking into a nearby haberdasher's window. Spade went to the Hotel Belvedere, asking at the desk for Mr. Cairo. He was told that Cairo was not in. The youth sat in a chair in a far corner of the lobby. 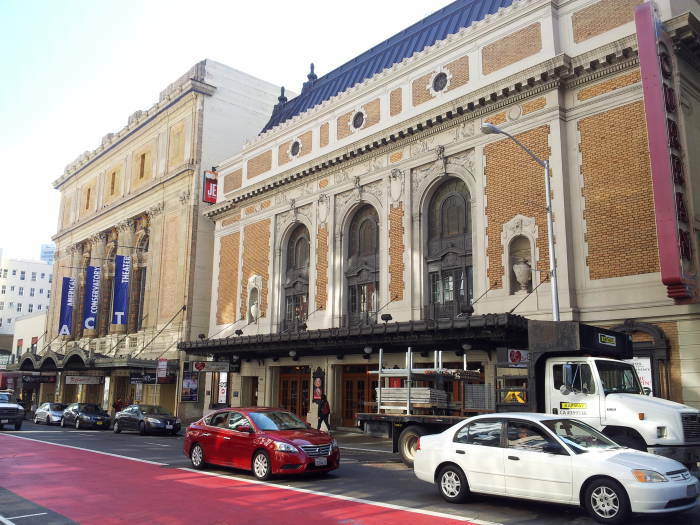 Spade went to the Geary Theatre, failed to see Cairo in the lobby, and posted himself on the curb in front, facing the theatre. The youth loitered with other loiterers before Marquard's restaurant below. 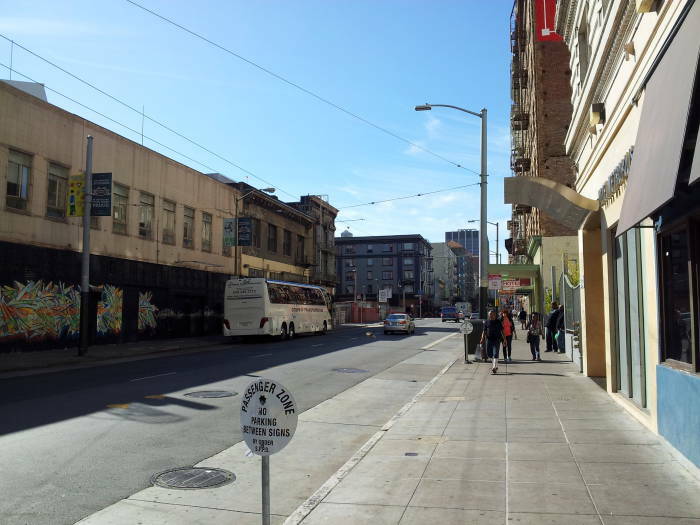 At ten minutes past eight Joel Cairo appeared, walking up Geary Street with his little mincing bobbing steps. Apparently he did not see Spade until the private detective touched his shoulder. He seemed moderately surprised for a moment, and then said: "Oh, yes, of course you saw the ticket." "Uh-huh. I've got something I want to show you." Spade drew Cairo back towards the curb a little away from the other waiting theatre-goers. "The kid in the cap down by Marquard's." 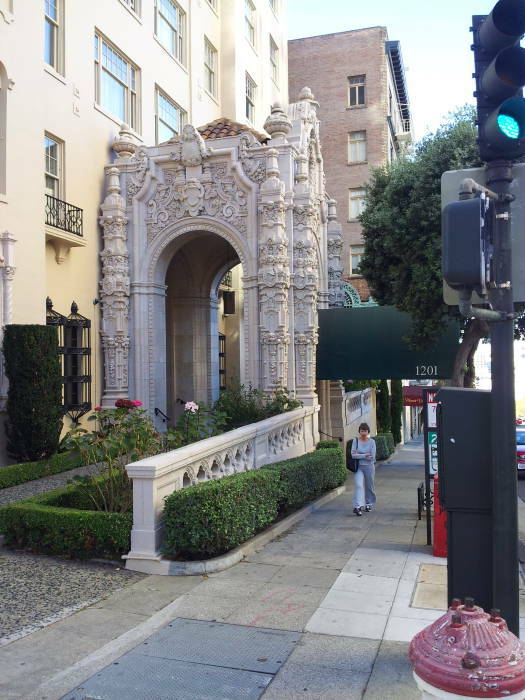 The hotel at 501 Geary Street was the Hotel Belvedere when Hammett was writing The Maltese Falcon. There have been some name changes, now the structure is partly signed as the Hotel Monaco and partly as the Hotel Belvedere. 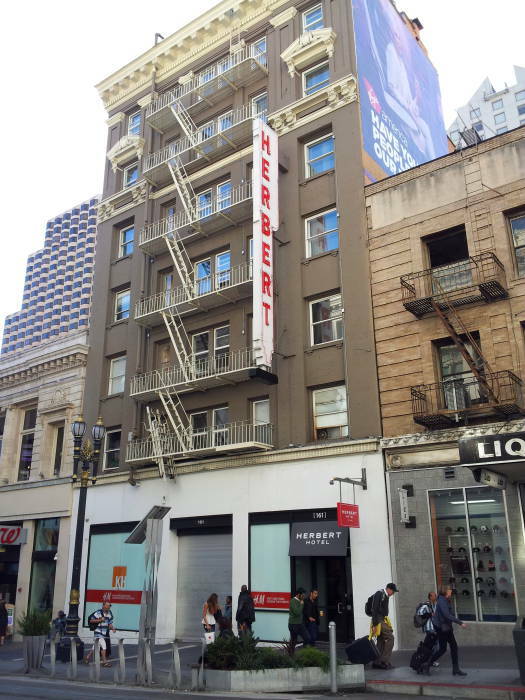 The Hotel Monaco sign is on the corner of the building. 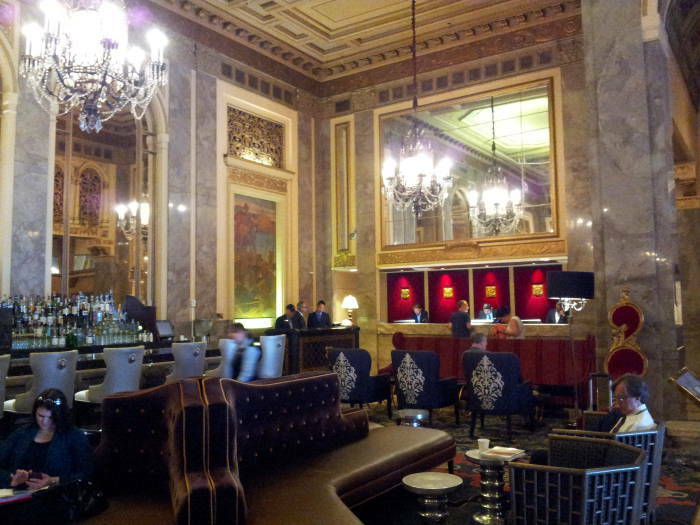 The part that's open is the next doorway down from the corner, the Kimpton Hotels chain is now running the Monaco. Marquard's Café, now the Pinecrest Restaurant, featured vaudeville acts, live music, and illegal alcohol sales. The Geary Theatre building was completed in 1910. It is still in operation, but due to changes in management it has gone through a long series of name changes. 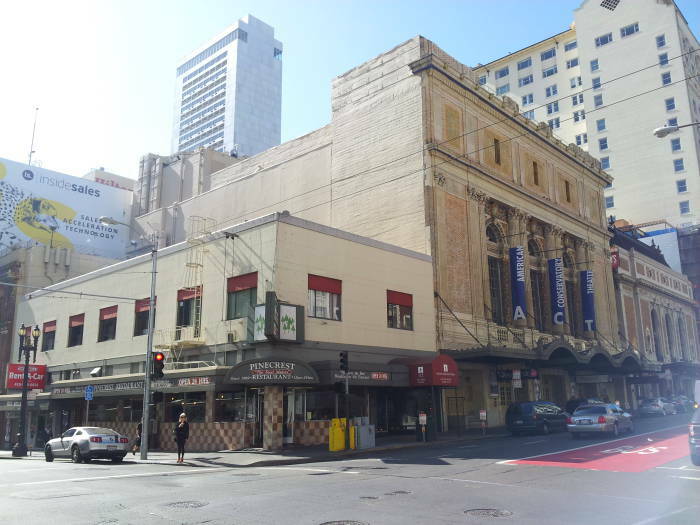 Originally it was the Columbia Theatre, then the Wilkes Theatre, then the Lurie Theatre, and then the Geary Theatre during the Maltese Falcon era of the early to mid 1920s. 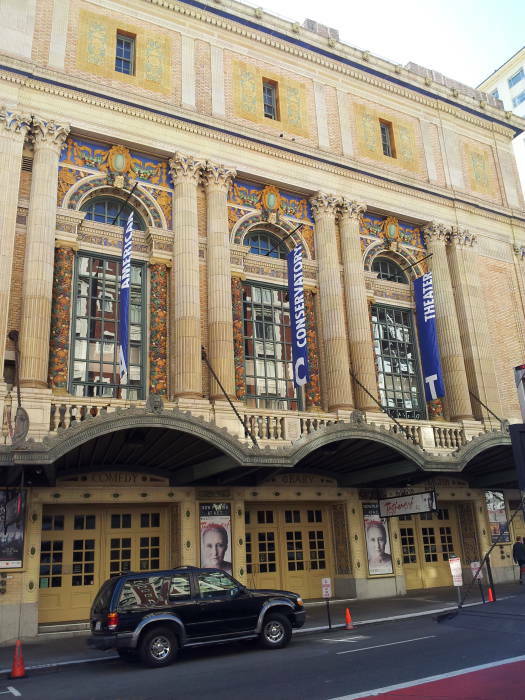 The American Conservatory Theatre organization has been around at least since the 1970s, and is accredited for granting Master of Fine Arts degrees in acting. In 2006 the facility took on the organization's name. 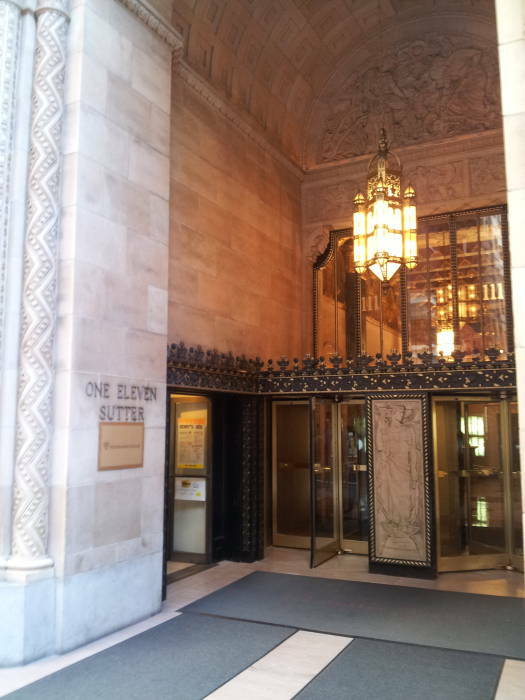 The mahogany door of suite 12-C at the Alexandria Hotel was opened by the boy Spade had talked to in the Belvedere lobby. Spade said, "Hello," good-naturedly. The boy did not say anything. He stood aside holding the door open. Spade went in. A fat man came to meet him. The fat man was flabbily fat with bulbous pink cheeks and lips and chins and neck, with a great soft egg of a belly that was all his torso, and pendant cones for arms and legs. As he advanced to meet Spade all his bulbs rose and shook and fell separately with each step, in the manner of clustered soap-bubbles not yet released from the pipe through which they had been blown. His eyes, made small by fatt puffs around them, were dark and sleek. Dark ringlets thinly covered his broad scalp. He wore a black cutaway coat, black vest, black satin Ascot tie holding a pinkish pearl, striped grey worsted trousers, and patent-leather shoes. His voice was a throaty purr. "Ah, Mr. Spade," he said with enthusiasm and held out a hand like a fat pink star. Spade took the hand and smiled and said: "How do you do, Mr. Gutman?" 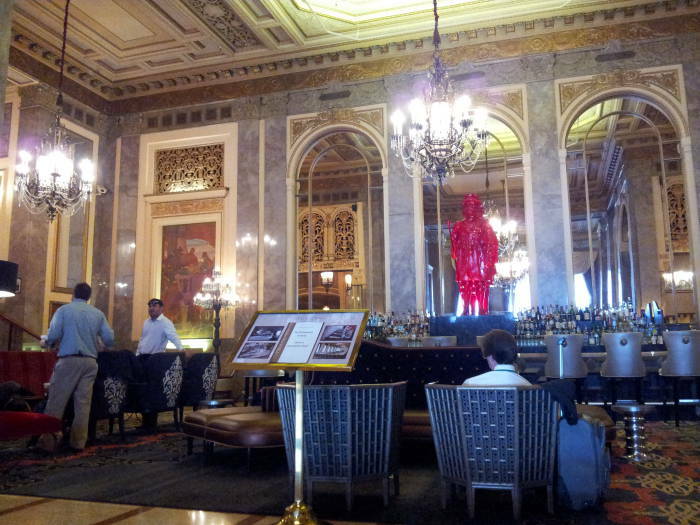 The Sir Francis Drake hotel opened in 1928 as another of the already numerous luxury hotels in San Francisco. In order to out-do its competition, they had an indoor golf course and advertised that there was a radio in every room (which, in the 1920s, was unusual). 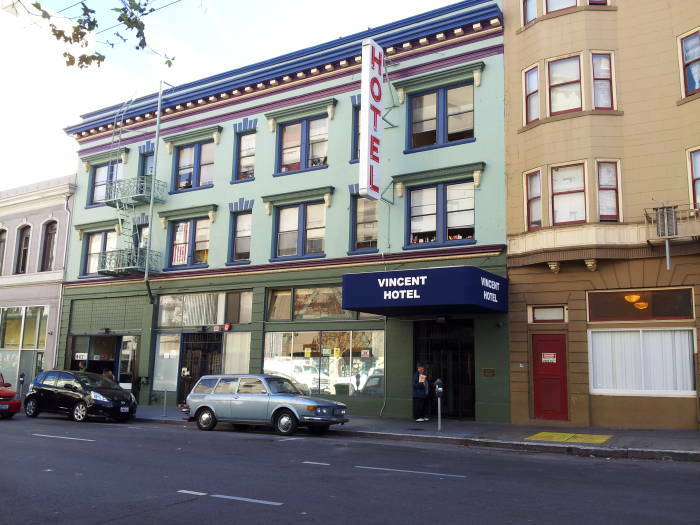 The hotel also advertised that its windows were made with "Vita-glass", a special form of glass that passed ultraviolet rays and allowed the guests to tan in their room. Spade rode down from Gutman's floor in an elevator. His lips were dry and rough in a face otherwise pale and damp. When you took out his handkerchief to wipe his face he saw his hand trembling. He grinned at it and said, "Whew!" so loudly that the elevator-operator turned his head over his shoulder and asked: "Sir?" 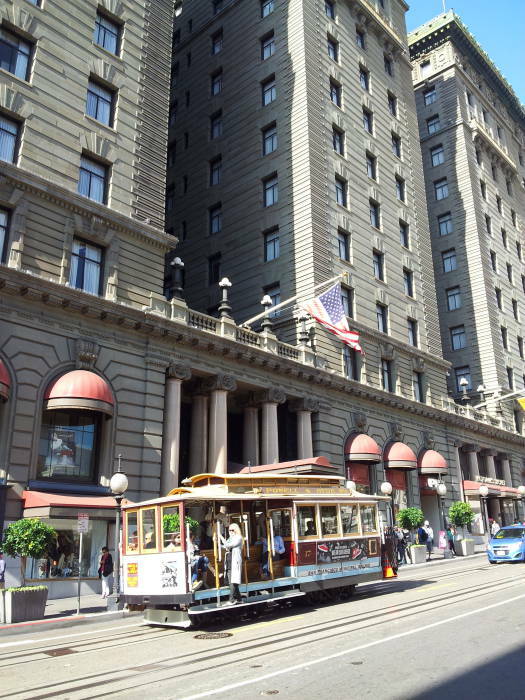 Spade walked down Geary Street to the Palace Hotel, where he ate luncheon. His face had lost its pallor, his lips their dryness, and his hand its trembling by the time he had sat down. He ate hungrily without haste, and then went to Sid Wise's office. 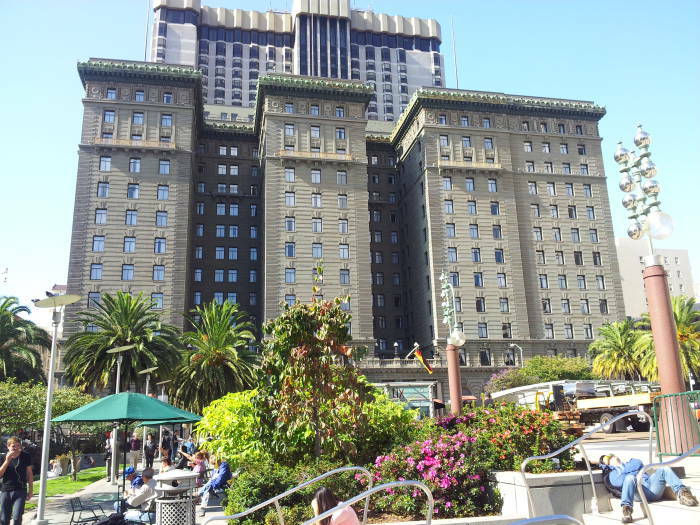 The "New" Palace Hotel opened in 1909, replacing the original which was destroyed in the 1906 earthquake. 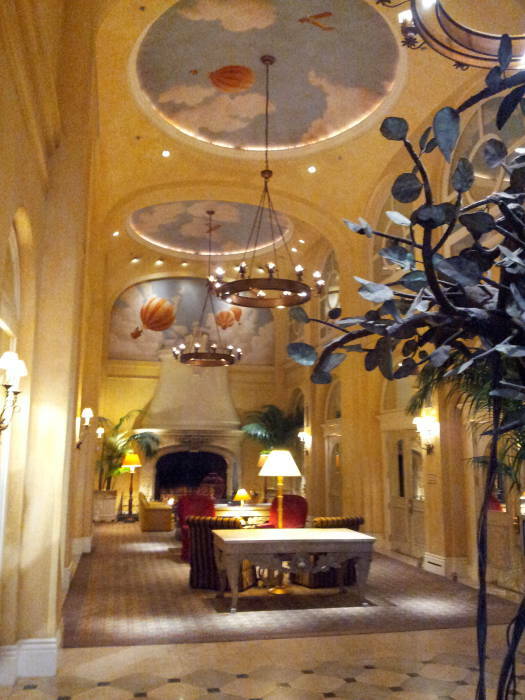 Its Garden Court or Palm Court restaurant has been one of the most prestigious hotel dining rooms in the city. Spade would have eaten in the Pied Piper Bar just off the lobby. King Kalakaua of Hawaii died in the original Palace Hotel in 1891. 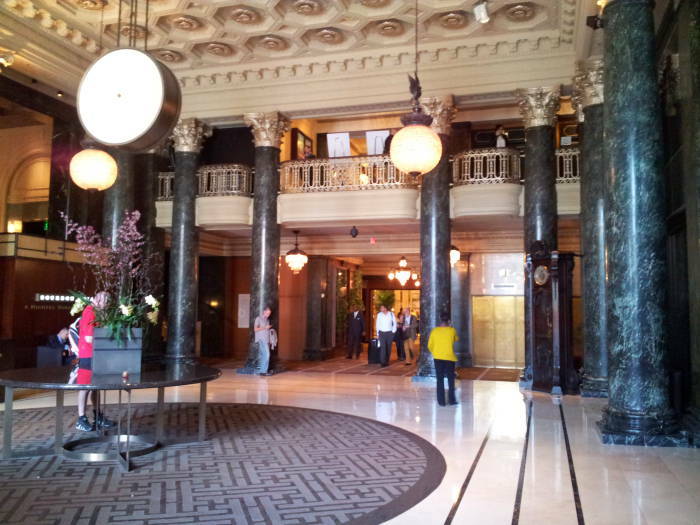 U.S. President Warren Harding died in the new Palace Hotel in 1923. Spade and Detective-Sergeant Polhaus ate pickled pigs' feet at one of big John's tables at the States Hof Brau. This nine-story steel-reinforced concrete building was completed in 1909, the largest concrete building in the world at the time. States Hof Brau occupied the entire first floor. Now an Old Navy store fills that space. The architect decorated the building in decorative terracotta sculpture plus multicolored tiles in green, rust, cream, and yellow. He wrote in Architect and Engineer, "The climate of our city is decidedly gray and this is accentuated all about town, especially in the large buildings, by the use of a particularly gloomy stone of a disagreeable yellowish-gray color that catches and absorbs much of the smudge carried on the winds." 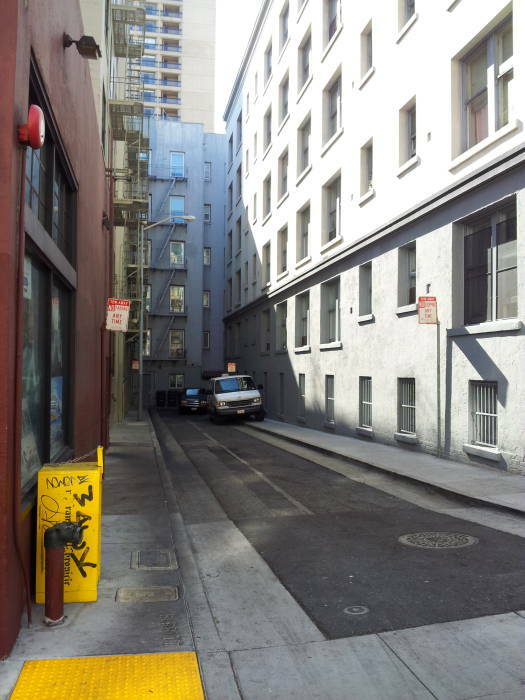 Carrying the parcel lightly under his arm, walking briskly, with only the ceaseless shifting of his eyes to denote wariness, Spade went, partly by way of an alley and a narrow court, from his office building to Kearny and Post Streets, where he hailed a passing taxicab. The taxicab carried him to the Pickwick Stage Terminal in Fifth Street. 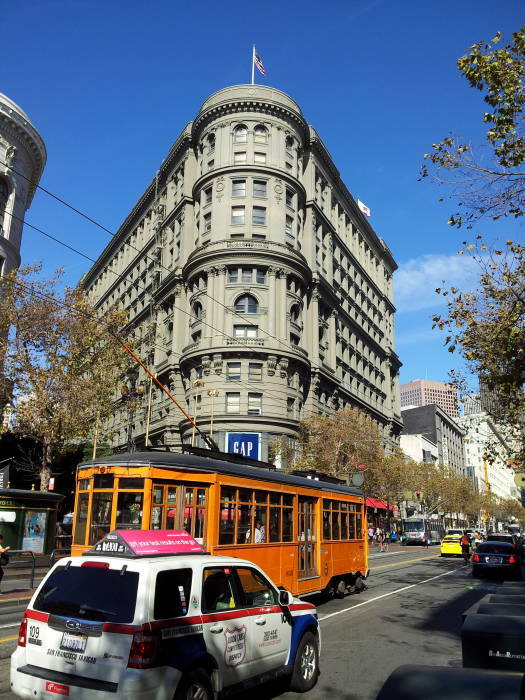 He checked the bird at the Parcel Room there, put the check in a stamped envelope, wrote M. F. Holland and a San Francisco Post Office box-number on the envelope, sealed it, and dropped it into a mail-box. From the stage-terminal another taxicab carried him to the Alexandria Hotel. 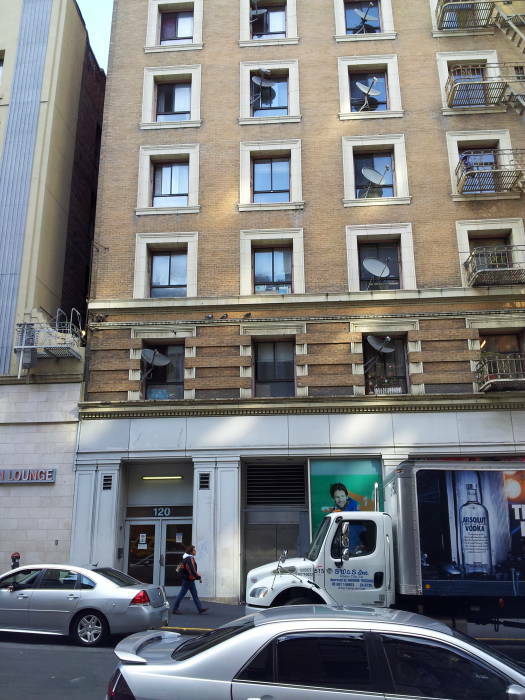 Spade went to the Pacific Telephone and Telegraph Company's station in Powell Street and called Davenport 2020. "Emergency Hospital please. ... Hello, there's a girl in suite twelve C at the Alexandria Hotel who has been drugged. ... Yes, you'd better send somebody to take a look at her. ... This is Mr. Hooper of the Alexandria." He put the receiver on its prong and laughed. He called another number and said: "Hello, Frank. This is Sam Spade. ... Can you let me have a car with a driver who'll keep his mouth shut? ... To go down the peninsula right away. ... Just a couple of hours. ... Right. Have him pick me up at John's, Ellis Street, as soon as he can make it." He called another number—his office's—held the receiver to his ear for a little while without saying anything, and replaced it on its hook. He went to John's Grill, asked the waiter to hurry his order of chops, baked potato, and sliced tomatoes, ate hurridly, and was smoking a cigarette with his coffee when a thick-set youngish man with a plaid cap askew above pale eyes and a tough cheery face came into the Grill and to his table. "All set, Mr. Spade. She's full of gas and rearing to go." In his bedroom that was a living-room now the wall-bed was up, Spade took Brigid O'Shaughnessy's hat and coat, made her comfortable in a padded rocking chair, and telephoned the Hotel Belvedere. Cairo had not returned from the theatre. Spade left his telephone-number with the request that Cairo call him as soon as he came in. 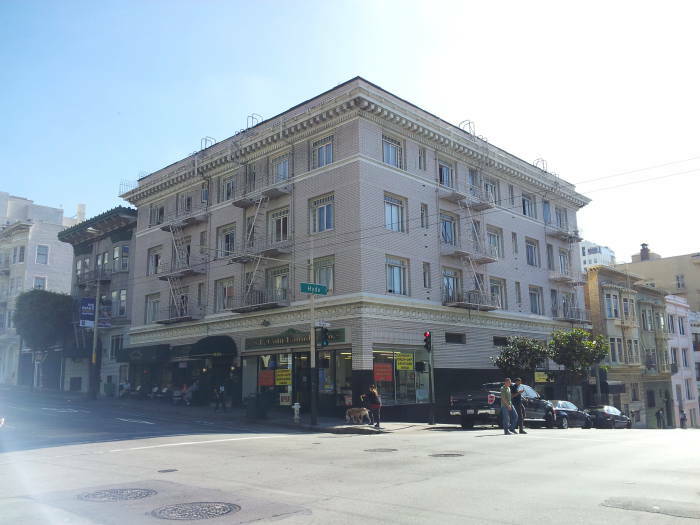 Hammett's apartment was #401, on the top floor at the corner of the building overlooking the intersection of Post and Hyde. The current occupant has renovated it to recreate the Hammett/Spade home of the early 1920s. 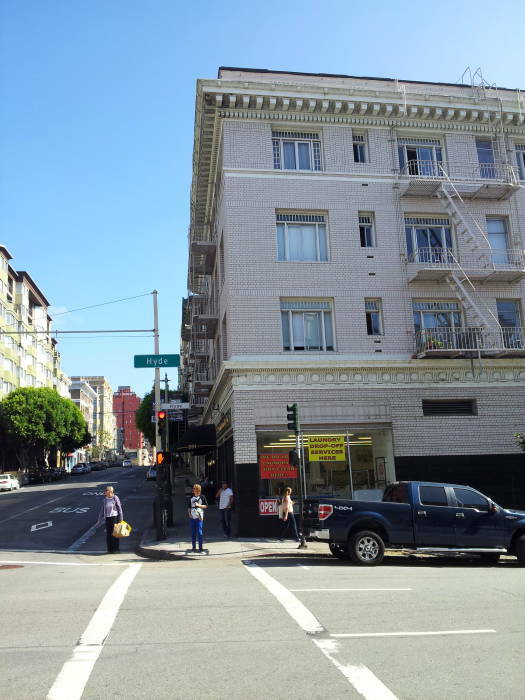 The last picture above shows the view from the corner directly below the apartment of Hammett and Spade, looking north-west across the intersection. 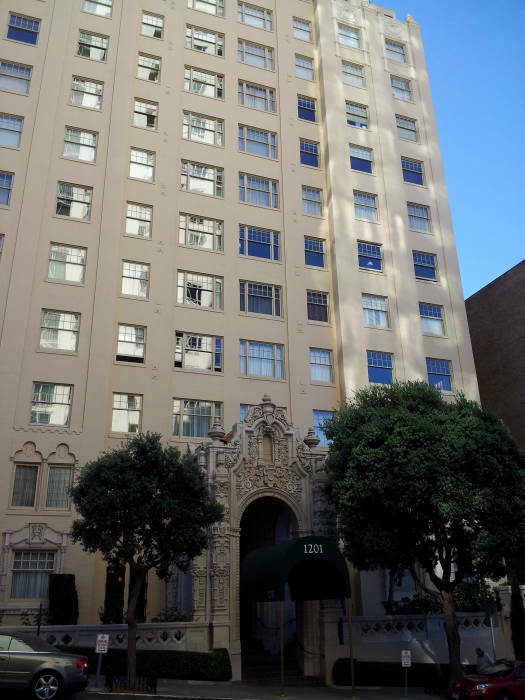 Hammett did most of the writing of The Maltese Falcon while living in that top-floor corner apartment at 891 Post Street. 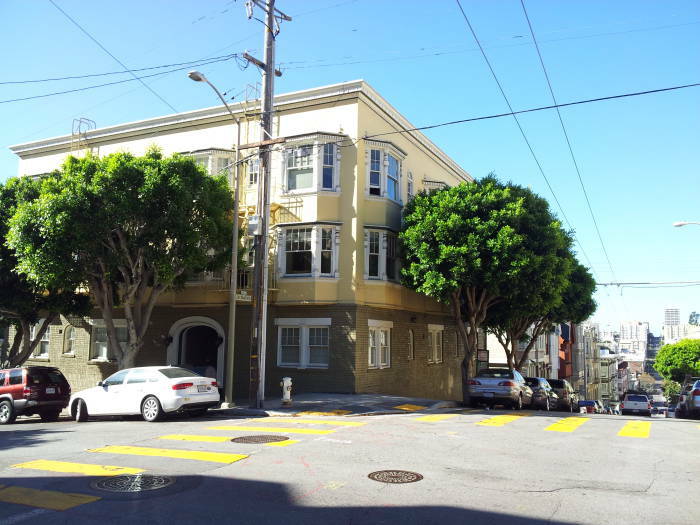 But he moved to 1155 Leavenworth, his last home in San Francisco, while finishing its final draft. Hammett left San Francisco in 1929, moving himself and his family to Los Angeles, where his wife had family. He soon left for New York with his new mistress, Nell Martin, to whom he dedicated his fourth novel The Glass Key. With the success of his novel The Maltese Falcon Hammett was drawn back to Hollywood. Within a few months of arriving there he met Lillian Hellman at a party at Daryl Zanuck's house. She was married to screenwriter Arthur Kober, and Hammett was still at least officially married to Jose, but Sam and Lillian left that party together and remained companions until his death in 1961. They both had other lovers and lived largely separate lives until Hammett's last few years, but they never really separated. For most of the 1930s Hammett and Hellman alternated between Hollywood and New York, as he wrote screenplays for films including City Streets and his books were turned into films. Hellman was the model for Nora Charles, the witty and wealthy heroine of Hammett's last published novel The Thin Man. Nick Charles was the hero of the book and series of movies, and in Hammett's novel the character mentions having worked as an investigator after the 1920 anarchist bombing on Wall Street. Hammett had turned to antifascist and civil rights causes in the 1930s and joined the Communist party in 1937. But in early 1942, after the Japanese attack on Pearl Harbor, Hammett somehow talked himself into another hitch in the U.S. Army. "The Battle of the Aleutians"
Here was a rail-thin 48-year-old alcoholic communist with a history of tuberculosis, a disabled veteran of the First World War, once again serving as a Sergeant in the U.S. Army. He spent most of the next three years in the bleak and mostly frozen Aleutian Islands. He edited an Army newspaper and coauthored The Battle of the Aleutians with Corporal Robert Colodny under the direction of Major Henry W Hall, an Infantry intelligence officer. Hammett returned from his Army service in the Aleutian Islands with emphysema as his latest pulmonary problem. He returned to political activism after the war, and became President of the Civil Rights Congress. The CRC was identified as a Communist front group, and Hammett was summoned to testify in a 1951 United States District Court case. Hammett refused to provide the information the government demanded, the identity of contributors to a fund to pay the bail for eleven men appealing their convictions. Hammett was found in contempt of court and sent to federal prison in Ashland, Kentucky for six months, where he had to clean toilets and mop floors. In 1953 Senator Joseph McCarthy summoned him to testify before the Senate Committee on Government Operations and the House Un-American Activities Committee on the topic of books written by Communist authors. Hammett was blacklisted and all radio programs featuring his characters were dropped, removing all sources of income. His health worsened. In 1957 he moved in with Hellman on the Upper East Side of New York City. In 1961 he died of lung cancer, diagnosed just two months before. He was a veteran of two World Wars and so he was buried at Arlington National Cemetery, but only over the objections of J. Edgar Hoover.